This is another film with strong medical theme and I think I’ll need to break this pattern soon or turn it into a season. Brandon Cronenberg’s directorial début was always going to be under a lot more scrutiny than other new directors because he is the son of David Cronenberg so naturally his work is going to be compared to his father’s and I think there is a some sign of that being justified. It’s a science fiction tale that takes our culture’s obsession with celebrity to a preposterous level with biotechnology not too far away from what presently exists. Syd March (Caleb Landry Jones) is a salesman with the Lucas Clinic, a firm which specialises in selling celebrity diseases to obsessive fans. He is very good at his job, seeming to understand his clients’ obsessions and exploiting their desires to sell them what they want and we see him doing his work on a young man Edward Porris (Douglas Smith) selling him a herpes virus on his face as if he caught from being kissed by Hannah Geist (Sarah Gadon). He also smuggles these diseases out to sell to his contacts in the black market. This is tricky due to a sophisticated protection tagging system that Lucas use to protect their property that stops them spreading beyond their clients. Syd has to smuggle the diseases out in his own body and use a stolen scanning machine to break the protection. Deliberately infecting himself takes its toll on Syd’s health and he seems to regularly have a thermometer in his mouth to check the progress of the infections. Syd’s black market contact Arvid (Joe Pingue) is a butcher who specialises in selling meat grown from cells harvested from celebrities. This does seem like cannibalism but since the meat is grown in vats it just gets by legally. Celebrities in this future don’t seem to famous for any reason other than they are talked about and obsessed over and they are talked about and obsessed over because they are famous, which is something that could be said of many of today’s celebrities of reality television. This very point is made by Syd’s boss Dorian (Nicholas Campbell) in a TV interview where he makes the point that celebrity is an illusion, a type of group delusion. The Lucas Clinic’s main resource is the exclusive contracts they have with the celebrities to harvest diseases from them. Their most popular celebrity is Hannah Geist and when she returns from holiday with a disease she’s picked up Syd is sent to collect some of her blood. He realises how valuable this is and injects himself with a small amount of the blood. The disease in the blood hits Syd very hard and it’s two days before he can get to work. The big news he missed while he was sick is that Hannah Geist died. Syd realises he’s infected with a fatal disease but he can’t let anyone else know or they will be literally after his blood. This includes Arvid’s creepy friend Levine (James Cade) who is keen to exploit the opportunity provided by Hannah Geist’s death for the rival company Vole & Tesser. 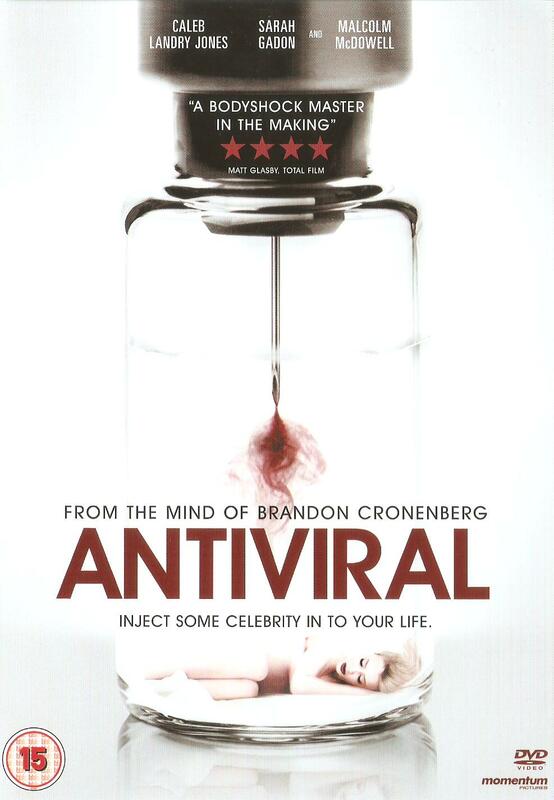 This is a pretty impressive début film for Brandon Cronenberg with a science fiction set-up being used as a very cynical commentary on celebrity culture. Every minute detail of celebrities is exploited with 24 hour rolling celebrity news discussing every medical condition in graphic detail which is pretty much the way news is going. Caleb Landry Jones gives a really good performance as the not exactly heroic Syd. Malcolm McDowell makes an appearance in the film as a doctor and it’s a small role but he gets to wax rhapsodical about the spiritual nature of the pleasure he gets when he strokes his celebrity skin grafts. There is a feel in the film that really does remind me of the early films of David Cronenberg nd this is also down similar unsettling score.